The vast build up of military assets in the Asia-Pacific signals a fundamental change in U.S. policy towards China. 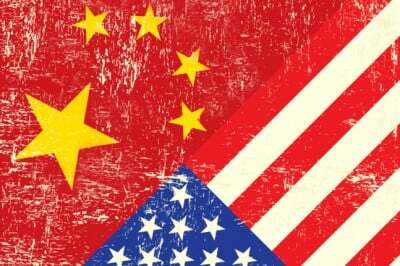 Washington no longer believes that China can be integrated into the existing US-led system. Recent actions taken by China– particularly the announcement that it planned to launch an Asian Infrastructure Investment Bank (AIIB) that would compete head-to-head with the World Bank and IMF— have set off alarms in the Capital where behind-the-scenes powerbrokers and think tank pundits agree that a more “robust” policy is needed to slow China’s ascendency. The current confrontation in the South China Sea–where the US has demanded that China immediately cease all land reclamation activities–indicates that the new policy has already been activated increasing the prospects of a conflagration between the two nuclear-armed adversaries. There’s no need to go over the details of China’s land reclamation activities in the Spratly Islands since reasonable people can agree that Washington has no real interest in a few piles of sand heaped up on reefs 10,000 miles from the United States. The man-made islands pose no threat to US national security or to freedom of navigation. The Obama administration is merely using the Spratlys as a pretext to provoke, intimidate and harass Beijing. The Spratly’s provide a justification for escalation, for building an anti-China coalition among US allies in the region, for demonizing China in the media, for taking steps to disrupt China’s ambitious Silk Roads economic strategy, and for encircling China to the West with US warships that threaten China’s access to critical shipping lanes and vital energy supplies. This is the ultimate objective; to bring China to its knees and to force it to comply with Washington’s diktats. This is what Washington really wants. For someone who doesn’t believe in a military solution, Carter is certainly adding a lot of lethal hardware to his arsenal. The question is: Why? Is Washington preparing for war? The United States will continue to protect freedom of navigation and overflight – principles that have ensured security and prosperity in this region for decades. There should be no mistake: the United States will fly, sail, and operate wherever international law allows, as U.S. forces do all around the world. America, alongside its allies and partners in the regional architecture, will not be deterred from exercising these rights – the rights of all nations. After all, turning an underwater rock into an airfield simply does not afford the rights of sovereignty or permit restrictions on international air or maritime transit. Who is Carter kidding? China poses no threat to freedom of navigation or overflight. The real threat is China’s participation in the $100 billion BRICS Development Bank which is set to finance some of the “largest projects of the modern history (including) the construction of new Eurasian infrastructure from Moscow to Vladivostok, in South China and India.” The so called BRICS (Brazil, Russia, India, China and South Africa) “represent 56% of world economic output, and account for 85% of world population. They control about 70% of the world’s foreign exchange reserves. They grow annually by an average of 4% —5%.” (Sputnik News) In other words, US-backed institutions are going to lose their exalted role as “underwriter for the global economy” because the world’s biggest infrastructure projects are going to be funded by China and its allies. Naturally, this doesn’t sit well with Washington where policy bigwigs are worried that US influence will gradually erode as global power inevitably shifts eastward. China is building the world’s greatest economic development and construction project ever undertaken: The New Silk Road. The project aims at no less than a revolutionary change in the economic map of the world…The ambitious vision is to resurrect the ancient Silk Road as a modern transit, trade, and economic corridor that runs from Shanghai to Berlin. The ‘Road’ will traverse China, Mongolia, Russia, Belarus, Poland, and Germany, extending more than 8,000 miles, creating an economic zone that extends over one third the circumference of the earth. Washington’s gambit in the Spratly’s is an attempt to reverse the tide, derail China’s current trajectory and insert the US as the regional kingpin who writes the rules and picks the winners. As Sec-Def Carter said in an earlier speech at the McCain Institute in Arizona, “There are already more than 525 million middle class consumers in Asia, and there will be 3.2 billion in the region by 2030.” US corporations want the lion’s-share of those customers so they can peddle their widgets, goose their stock prices and pump up their quarterly profits. Carter’s job is to help them achieve that objective. Summers goes on to acknowledge the threat that political dysfunction (on Capitol Hill) poses to “the dollar’s primary role in the international system”. It’s clear that Summers grasps the gravity of what has unfolded and the challenge the AIIB poses to US hegemony. Readers should note that Summers ominous warnings were delivered just months before Washington dramatically revamped its China policy which suggests that the announcement of the AIIB was the straw that broke the camel’s back. Shortly after, the Obama administration made “crucial changes” to the existing policy. Containment and integration were replaced with the current policy of intimidation, incitement and confrontation. Beijing was elevated to Public Enemy Number 1, America’s primary strategic rival. What happens next, should be fairly obvious to anyone who has followed US meddling in recent years. The US is now at war with China, which means that it will use all of its resources and capabilities, except it’s military assets, to defeat the enemy. The United States will not militarily engage an enemy that can fight back or inflict pain on the US. That’s the cardinal rule of US military policy. While that precludes a nuclear conflagration, it does not exclude a hyperbolic propaganda campaign demonizing China and its leaders in the media (Sadly, the comparisons to Hitler and the Kaiser have already started), asymmetrical attacks on Chinese markets and currency, excruciating economic sanctions, US-NGO funding for Chinese dissidents, foreign agents and fifth columnists, intrusions into China’s territorial waters and airspace, strategic denial of critical energy supplies, (80 percent of China’s oil supplies are delivered via the Malacca Strait to the South China Sea) and, finally, covert support for “moderate” jihadis who are committed to toppling the Chinese government and replacing it with an Islamic Caliphate. All of these means and proxies will be employed to defeat Beijing, to derail its ambitious Silk Roads strategy, to curtail its explosive growth, and to sabotage its plan to be the preeminent power in Asia. Washington has thrown down the gauntlet in the South China Sea. If Beijing wants to preserve its independence and surpass the US as the world’s biggest economy, it’s going to have to meet the challenge, prepare for a long struggle, and beat Uncle Sam at his own game. It won’t be easy, but it can be done.